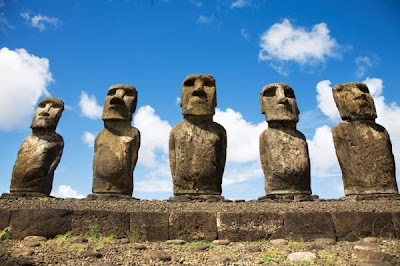 WHO MADE THE MOAI STATUES? Interlocutor: Who did build the monuments of Pascua Island? I mean especially to those gigantic Moai that have 23 meters high and a weight of 80 tons each. Ruanel: They were built by an extraterrestrial civilization. Interlocutor: Could we know where they came from? Ruanel: Yes, they came from a star that is at tens of light years from our Solar system. Interlocutor: Did they cohabit with the islanders? Ruanel: Not only did they cohabit with them, but rather they dominated and subjugated them. Interlocutor: In which century were they built? Ruanel: They were built approximately six hundred years ago. Interlocutor: what was their purpose to build them? Ruanel: They built them for the inhabitants. Interlocutor: Were those extraterrestrials childish? Interlocutor: I understand. I believe that they built them with anti-gravitational machines. Is it correct? Ruanel: Of course. Each monument weighted several tons. Interlocutor: What was represented with those faces? I mean if they were the representation of some deity or something similar. Ruanel: Directly they represented themselves. The faces were theirs. Interlocutor: Well, then they were quite ugly. No wonder they subjected the islanders! ... But, aside from this joke, I don't understand why they sculpted their own faces. Ruanel: They wanted to be worshipped. Interlocutor: The same old story! Was there some special reason for which they built them with their backs to the sea? Ruanel: No, no especial reason. Interlocutor: Is it known how those aliens were called? Ruanel: The first aliens that arrived to the island were called Kabec. Then others came, The Dorm who were a race of beings of darkish color, very similar to the black terrestrial, but not so hairless. Interlocutor: Did they come in peace? Ruanel: No, because there was a war between them and at the end all of them left the island with the natives alone, and the aliens remained in the hazy memory of the natives. Interlocutor: How many years passed between the first aliens arrival and the arrival of the second race? Ruanel: Approximately two hundred years. Interlocutor: Did the aliens take the islanders or they left them? I ask it because it seems to be customary for the aliens to come to our planet and abduct natives. Ruanel: No, they didn't take them. Not in this case. The islanders simply emigrated to other places, as Tahiti or the Chilean coast. Interlocutor: Why did the islanders call Easter Island, naturally in their language, "the navel of the world"? Ruanel: It was an arbitrary name, the island was in the middle of the ocean. It didn’t have any other basis.